Professional development of state auditors is a permanent SAO activity through cooperation with other institutions. This time, three-day performance audit training for 22 state auditors was organized in SAO premises. 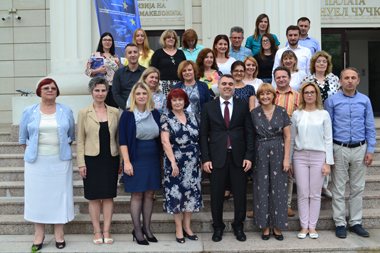 The training was delivered within Twining Project Component 2, Activity 2.3., by the experts from Bulgaria National Audit Office - Detelina Hadzieva and Ivanka Kesjakova. The activity was closed with official awarding of auditors with Certificates for successful completion of the performance audit training by Deputy Auditor General Naser Ademi. Photos of the event are available on the link below.